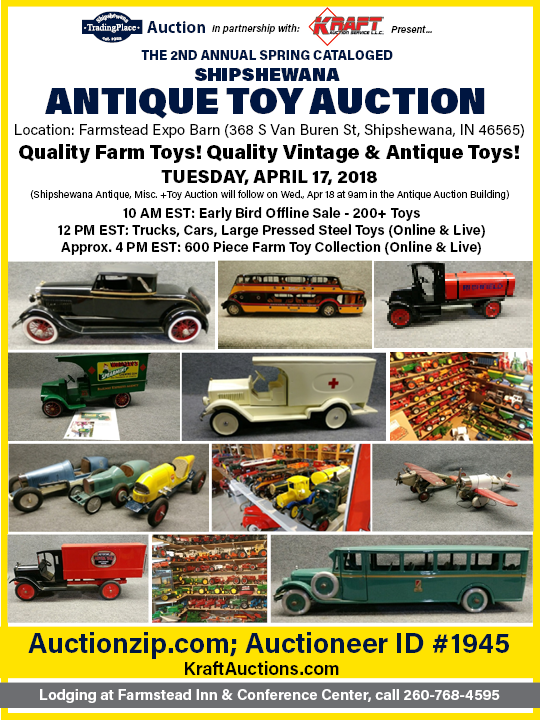 Quality Toys including precision toy tractors, pedal tractors, boxed toys, pressed steel, tin wind-ups, custom toys and much more! Online bidding on KraftAuctions.com, AuctionZip, INvaluable and Proxibid Phone and Absentee Bids Welcome. Terms: Cash, all major forms of credit cards, and good check. 3% service fee for credit cards. 10% buyer's premium onsite. 20% buyer's premium online. 7% Indiana sales tax. Settlement day of the auction. Not responsible for accidents for items after sold. Everything sold as-is. Announcements day of sale take precedence over printed material.